Pictured here is a typical Schlage F Series Plymouth design entrance knob set. Schlage have been selling versions of this Grade 3 product across the market for about 15 years now. The most common complaint, from an overwhelming quantity of purchasers of this product, is the ease of ability to get locked out. You see, the typical F Series knobset was designed by someone without taking into consideration the pitfalls of the classic emergency escape mentality. Until a recent product update that has dramatically changed this product (and all F series knobs too), Schlage, in their infinite wisdom, had allowed the inside turn button to actually lock the outside of the knob, while still allowing the inside of the knob to remain unlocked. That poorly designed feature, was to maintain emergency egress (escape) function to comply with the International Building Codes demands. But so many people found themselves accidentally locked out of their homes as a consequence. It is not uncommon, to lock the door, using the little turn button inside and then "forget" that the lock is locked, when turning the handle to exit, effectively locking yourself out. (I have seen multiple instances of different people accidentally locked out in their underwear, from this). 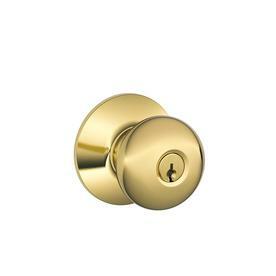 Schlage have answered the demands of the market and converted the new F series line, so that turning the inside knob, actually unlocks the outside handle. I expect that the thousands of locksmiths across the world who have made so much money over the years from attending to lockouts, are bitterly disappointed in this turn of events, but good on Schlage for stepping up and answering the call of the thousands of bitter customers who have used these products for so many years. Our ever so popular Lockwood 7444 Keyed Pocket Door Lock has literally been flying off the shelves to unabated demand. As previously mentioned, the cost of this product is now returning to the previously listed price (from 12 months ago) of $125.00. Shipping is still the same rate and varies by options of Ground, Economy Overnight and Priority Overnight. Our expansion kit, to allow installation to thicker doors is still delayed, unfortunately. We recently supplied our expansion design to about 10 separate installers to understand the viability and effectiveness of the modification kit, While the kit performed to task and exceeded our expectations, the difficulty in accurately installing the modification kit (drilling the correct holes) proved somewhat difficult for 50% of our test group. (Our test group being experienced contractors and carpenters). For this reason, we are holding the release of the kit until significant improvements are made that will make installation painless. With this price increase, we understand that some may feel put off by the meteoric increase, but we discounted the product 12 months ago thanks to our supplier giving us a quantity discount even though the exchange rate was significantly higher. Combine with the shipping and customs costs (everyone has their hand in it - as usual) and our hands are forced. Compare our cost to the other products in the market and we are still significantly cheaper for this highly sought after, quality product. A recent report tabled by the Royal Astronomical Society, published Thursday July 9, 2015, highlights the phenomenon known as The Maunder Minimum. A respected Russian scientist, Prof Valentina Zharkova has just published findings about this repeating event that affects not only our planet but most of our solar system too. But, as we are the only known (to us) planet with educated life, these findings will have a noticeable affect on the daily lives of most of the planets inhabitants, within the next 20 years. The Maunder Minimum is the event that determines sunspot activity and directly interferes with our planets weather patterns. One of the more recent Maunder Minimum observations was recorded in the years 2000-2001 and threw out a slew of orbiting satellites, interrupting global communications and, for all intensive purposes, marking the possible beginning of the 1000 year drought currently being experienced in the western part of the United States. The report tabled by Prof Zharkova, highlights a 30 year study, using widely sourced astronomical records to produce a model that is suggesting close to a 97% accuracy in predicting the next 'mini ice age' that will affect our planet. According to the report (in the source below), the model suggests that solar activity will fall by 60% in the 2030's, "to conditions last seen during the 'mini ice age' seen in 1645" . So, why is this pertinent to this website? There is an overwhelming market, currently unfolding across the world. The age of the electronic connected smartlock is currently a multi-billion dollar a year industry and is set to increase exponentially in the next 2-5 years. People everywhere are increasingly interested in having and using electronic, connected lock and door systems that require infrastructure (wiring) to maintain power to operate. Even if a product is touted as wireless or battery powered, it still uses internal wiring to run the electronics on board. More well known to the average person, is the facts that anytime water (humidity, condensation etc) gets into any electronic component, those components suffer sometimes catastrophic failures. The locksmith industry evolved to include electronics into products aimed at improving inter-operability of mechanical locking systems. For many years the simple electric strike was seen as the introduction of the modern electronic security products field, with many apartment complexes across the world eliminating the concierge or front desk guard, in favor of intercom systems that directly control the entry to the building and consequently access to residents/tenants therein. Even today, the reach of electronics has invaded our homes and offices, our cars and buses, our trains and planes. many of these same services were previously operated using mechanical products that seemed to last forever with minimal maintenance. Yes, electronics has improved our lives trememdously, however the age of the mechanical door lock is far from over. The unrealistic expectations of market driven capitalists hoping to cash in on this evolving market, is seeing an increasing multitude of variations of products aimed at whetting our appetites to the better mousetrap. But with all the electronics cluttering up our locks, there is less and less room for the quality components that actually provide the protection we are seeking for our families and our properties. And with the Maunder Minimum set to rear it's ugly head again, only this time with an extended 'mini ice age' similar to the 70 year one experience in the mid 1600's, the age of failing electronics and unsecure doors, safes, gates, vehicles etc is again upon us. To those who still agree that your security, the security of your family, your home, your office or your friends and coworkers is something you take seriously and not for granted, investing in the tried and true mechanical physical options, that protect and secure without the costly electronics (that will fail), the industry applauds you as forward thinking people. Our very popular Lockwood 7444 Keyed Pocket Door Lock is selling extremely fast with fewer than 10 remaining in inventory. We are expecting replenishing supplies July 24th, 2015. At this time, we expect that due to manufacturer cost increases, the cost for this wonderful, in demand product will increase consequently. We are unsure as to the anticipated cost, at this time, but are expecting at least a 25% increase. So, if you have been sitting on the fence, hurry while stocks last at the old price. Little Known Key Facts - Does Your Key have A Twin? A report on Fox 4 News out of Kansas City, Missouri on July 6, 2015 exposed a little known phenomena that many people probably dont realize. Many keys that we all use every day, may in fact be copied throughout the marketplace. Manufacturers only make a limited number of keys for their systems, but the probability of finding a matching set of keys is quite rare, except in the case of a woman in Kansas City, Missouri (see the link in the source below). She bought 2 Honda vehicles, 2 years apart and was surprised to find that the mechanical keys were actually identical for both separate, yet different vehicles. Now, this does not mean that you may be lucky to find someone else with your key too and in the case of the modern automobile industry, this is actually irrelevant thanks to the use of transponders or electronic chips embedded in keys that read the onboard vehicle computer. But it is still newsworthy.